For those hoping to catch a glimpse of alien visitors from other worlds, Cley Hill is UFO central. Apparently there have been hundreds, if not thousands, of strange lights spotted in the sky from the Wiltshire hill over the past 50 years or so. It is quite close to Cradle Hill, which I visited earlier this year and is also considered to be a UFO hotspot. I drove past Cley Hill on my way back from Glastonbury Festival after my sat nav decided to take me on a cross-country scenic route rather than via main roads. I didn't see any flying saucers or little green men while I was there. As a pagan, my interest in the site is more that there is an ancient burial mound at the top and rare orchids grow on its grassy slopes. The description on Megalithic Portal simply says: "Hillfort in Wiltshire. 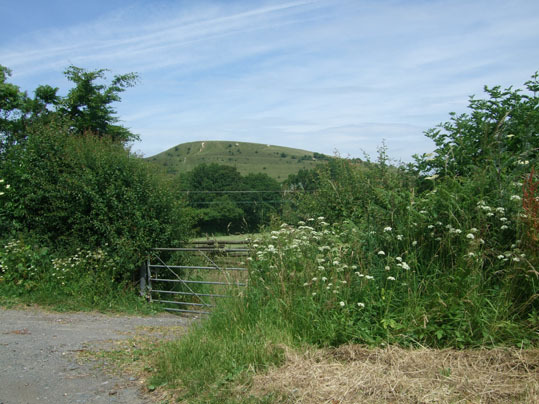 A freestanding hill with views in all directions, owned by the National Trust. Part has been damaged by chalk quarrying in the past. There is a round barrow on top. Apparently orchids can be found growing here."